Mass estimates are a big deal in paleobiology. If you want to know how much an animal needed in terms of food, water, and oxygen, or how fast it could move, or how many offspring it could produce in a season, or something about its heat balance, or its population density, or the size of its brain relative to its body, then at some point you are going to need a mass estimate. All that is true, but it’s also a bit bogus. The fact is, people like to know how big things are, and paleontologists are not immune to this desire. We have loads of ways to rationalize our basic curiosity about the bigness of extinct critters. And the figuring out part is both very cool and strangely satisfying. So let’s get on with it. There are two basic modes for determining the mass of an extinct animal: allometric, and volumetric. Allometric methods rely on predictable mathematical relationships between body measurements and body mass. You measure a bunch of living critters, plot the results, find your regression line, and use that to estimate the masses of extinct things based on their measurements. Allometric methods have a couple of problems. One is that they are absolutely horrible for extrapolating to animals outside the size range of the modern sample, which ain’t so great for us sauropod workers. The other is that they’re pretty imprecise even within the size range of the modern sample, because real data are messy and there is often substantial scatter around the regression line, which if faithfully carried through the calculations produces large uncertainties in the output. The obvious conclusion is that anyone calculating extinct-animal masses by extrapolating an allometric regression ought to calculate the 95% confidence intervals (e.g. “Argentinosaurus massed 70000 kg, with a 95% confidence interval of 25000-140000 kg), but, oddly, no-one seems to do this. Volumetric methods rely on creating a physical, digital, or mathematical model of an extinct animal, determining the volume of the model, multiplying by a scale factor to get the volume of the animal in life, and multiplying that by the presumed density of the living animal to get its mass. Volumetric methods have three problems: (1) many extinct vertebrates are known from insufficient material to make a good 3D model of the skeleton; (2) even if you have a complete skeleton, the method is very sensitive to how you articulate the bones–especially the ribcage–and the amount of flesh you decide to pack on, and there are few good guidelines for doing this correctly; and (3) relatively small changes in the scale factor of the model can produce big changes in the output, because mass goes with the cube of the linear measurement. If your scale factor is off by 10%, you mass will be off by 33% (1.1^3=1.33). On the plus side, volumetric mass estimates are cheap and easy. You don’t need hundreds or thousands of measurements and body masses taken from living animals; you can do the whole thing in your kitchen or on your laptop in the space of an afternoon, or even less. In the old days you’d build a physical model, or buy a toy dinosaur, and use a sandbox or a dunk tank to measure the volume of sand or water that the model displaced, and go from there. 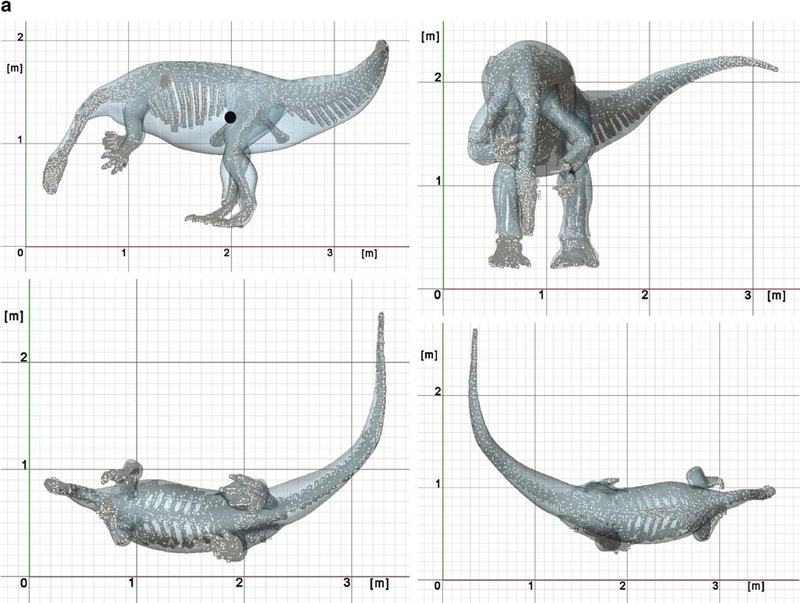 Then in the 90s people started building digital 3D models of extinct animals and measuring the volumes of those. But you don’t need a physical model or a dunk tank or even a laptop to do volumetric modeling. Thanks to a method called graphic double integration or GDI, which is explained in detail in the next section, you can go through the whole process with nothing more than pen and paper, although a computer helps. Volumetric methods in general, and GDI in particular, have one more huge advantage over allometric methods: they’re more precise and more accurate. In the only published study that compares the accuracy of various methods on extant animals of known mass, Hurlburt (1999) found that GDI estimates were sometimes off by as much as 20%, but that allometric estimates were much worse, with several off by 90-100% and one off by more than 800%. GDI estimates were not only closer to the right answers, they also varied much less than allometric methods. On one hand, this is good news for GDI afficionados, since it is the cheapest and easiest of all the mass estimation methods out there. On the other hand, it should give us pause that on samples of known mass, the best available method can still be off by as much as a fifth even when working with complete bodies, including the flesh. We should account for every source of error that we can, and still treat our results with appropriate skepticism. GDI was invented by Jerison (1973) to estimate the volumes of cranial endocasts. Hurlburt (1999) was the first to apply it to whole animals, and since then it has been used by Murray and Vickers-Rich (2004) for mihirungs and other extinct flightless birds, yours truly for small basal saurischians (Wedel 2007), Mike for Brachiosaurus and Giraffatitan (Taylor 2009), and probably many others that I’ve missed. One of the cool things about GDI is that it is not just easy to separate out the relative contributions of each body region (i.e., head, neck, torso, limbs) to the total body volume, it’s usually unavoidable. This not only lets you compare body volume distributions among animals, it also lets you tinker with assigning different densities to different body parts. Naturally I’m not going to introduce GDI without taking it for a test drive, and given my proclivities, that test drive is naturally going to be on a sauropodomorph. All we need is an accurate reconstruction of the test subject from at least two directions, and preferably three. You could get these images in several ways. You could take photographs of physical models (or toy dinosaurs) from the front, side, and top–that could be a cool science fair project for the dino-obsessed youngster in your life. You could use the white-bones-on-black-silhouette skeletal reconstructions that have become the unofficial industry standard. You could also use orthogonal photographs of mounted skeletons, although you’d have to make sure that they were taken from far enough away to avoid introducing perspective effects. Of course, this is just a skeleton, and for GDI I need the body outline with the flesh on. So I opened the image in GIMP (still free, still awesome) and drew on some flesh. Here we necessarily enter the realm of speculation and opinion. I stuck pretty close to the skeletal outline, with the only major departures being for the soft tissues ventral to the vertebrae in the neck and for the bulk of the hip muscles. As movie Boromir said, there are other paths we might take, and we’ll get to a couple of alternatives at the end of the post. This third image is the one I used for actually taking measurements. You need to lop off the arms and legs and tote them up separately from the body axis. I also filled in the body outlines and got rid of the background so I wouldn’t have any distracting visual clutter when I was taking measurements. I took the measurements using the measuring tool in GIMP (compass icon in the toolbar), in orthogonal directions (i.e., straight up/down and left/right), at regular intervals–every 20 pixels in this case. One thing you’ll have to decide is how many slices to make. Ideally you’d do one slice per pixel, and then your mathematical model would be fairly smooth. There are programs out there that will do this for you; if you have a 3D digital model you can just measure the voxels (= pixels cubed) directly, and even if all you have is 2D images there are programs that will crank the GDI math for you and measure every pixel-width slice (Motani 2001). But if you’re just rolling with GIMP and OpenOffice Calc (or Photoshop and Excel, or calipers and a calculator), you need to have enough slices to capture most of the information in the model without becoming unwieldy to measure and calculate. I usually go with 40-50 slices through the body axis and 9 or 10 per limb. The area of a circle is pi*r^2, and the area of an ellipse is pi*r*R, where r and R are the radii of the minor and major axes. So enter the widths and heights of the body segments in pixels in two columns (we’ll call them A and B) in your spreadsheet, and create a third column with the function 3.14*A1*B1/4. Divide by four because the pixel counts you measured on the image are diameters and the formula requires radii. If you forget to do that, you are going to get some wacky numbers. 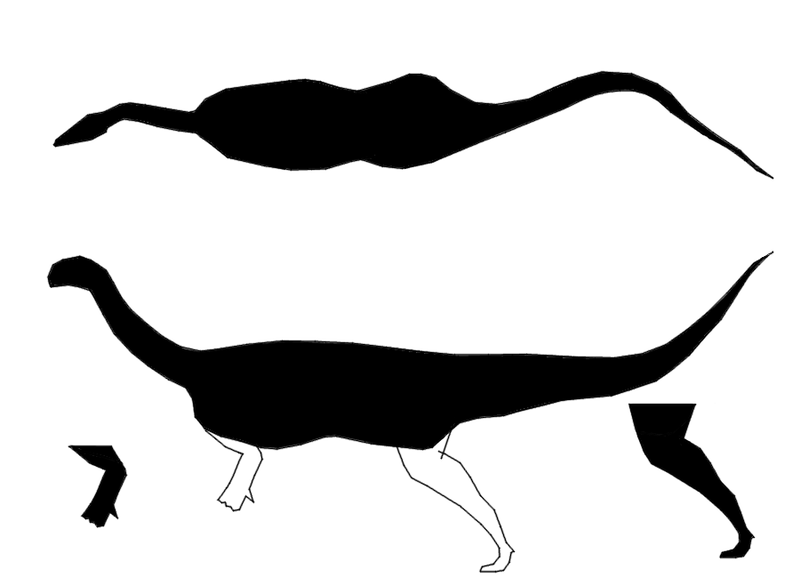 One obvious departure from reality is that the method assumes that all of the body segments of an animal have elliptical cross-sections, when that is often not exactly true. But it’s usually close enough for the coarse level of detail that any mass estimation method is going to provide, and if it’s really eating you, there are ways to deal with it without assuming elliptical cross-sections (Motani 2001). For each body region, average the resulting areas of the individual slices and multiply the resulting average areas by the lengths of the body regions to get volumes. Remember to measure the lengths at right angles to your diameter measurements, even when the body part in question is curved, as is the tail of Heinrich’s Plateosaurus. For sauropods you can usually treat the limbs as cylinders and just enter the lateral view diameter twice, unless you are fortunate enough to have fore and aft views. It’s not a perfect solution but it’s probably better than agonizing over the exact cross sectional shape of each limb segment, since that will be highly dependent on how much flesh you (or some other artist) put on the model, and the limbs contribute so little to the final result. For Plateosaurus I made the arm circular, the forearm and hand half as wide as tall, the thigh twice as long as wide, and the leg and foot round. Don’t forget to double the volumes of the limbs since they’re paired! Already one of the great truths of volumetric mass estimates is revealed: we tend to notice the extremities first, but really it is the dimensions of the trunk that drive everything. You could double the size of any given extremity and the impact on the result would be noticeable, but small. Consequently, modeling the torso accurately is crucial, which is why we get worried about the preservation of ribs and the slop inherent in complex joints. The 170 cm scale bar in Heinrich’s figure measures 292 pixels, or 0.582 cm per pixel. The volume of each body segment must be multiplied by 0.582 cubed to convert to cubic cm, and then divided by 1000 to convert to liters, which are the lingua franca of volumetric measurement. If you’re a math n00b, your function should look like this: volume in liters = volume in pixels*SF*SF*SF/1000, where SF is the scale factor in units of cm/pixel. Don’t screw up and use pixels/cm, or if you do, remember to divide by the scale factor instead of multiplying. Just keep track of your units and everything will come out right. If you’re not working from an example as perfect as Heinrich’s digital (and digitally measured) skeleton, you’ll have to find something else to use for a scale bar. Something big and reasonably impervious to error is good. I like the femur, if nothing else is available. Any sort of multi-segment dimension like shoulder height or trunk length is going to be very sensitive to how much gloop someone thought should go between the bones. Total length is especially bad because it depends not only on the intervertebral spacing but also on the number of vertebrae, and even most well-known dinos do not have complete vertebral series. Finally, multiply the volume in liters by the assumed density to get the mass of each body segment. Lots of people just go with the density of water, 1.0 kg/L, which is the same as saying a specific gravity (SG) of 1. Depending on what kind of animal you’re talking about, that may be a little bit off or it may be fairly calamitous. Colbert (1962) found SGs of 0.81 and 0.89 for an extant lizard and croc, which means an SG of 1.0 is off by between 11% and 19%. Nineteen percent–almost a fifth! For birds, it’s even worse; Hazlehurst and Rayner (1992) found an SG of 0.73. I got numbers. Now what? I’m going to describe three possible things you could do with the results once you have them. In my opinion, two of them are the wrong the thing to do and one is the right thing to do. DON’T mistake the result of your calculation for The Right Answer. You haven’t stumbled on any universal truth. Assuming you measured enough slices and didn’t screw up the math, you know the volume of a mathematical model of an organism. If you crank all the way through the method you will always get a result, but that result is only an estimate of the volume of the real animal the model was based on. There are numerous sources of error that could plague your results, including: incomplete skeletal material, poorly articulated bones, wrong scale factor, wrong density, wrong amount of soft tissue on the skeleton. I saved density and gloop for last because you can’t do much about them; here the strength of your estimate relies on educated guesses that could themselves be wrong. In short, you don’t even know how wrong your estimate might be. DON’T assume that the results are meaningless because you don’t know the actual fatness or the density of the animal, or because your results don’t match what you expected or what someone else got. I see this a LOT in people that have just run their first phylogenetic analysis. “Why, I could get any result I wanted just by tinkering with the input!” Well, duh! Like I said, the method will always give you an answer, and it won’t tell you whether the answer is right or not. The greatest advantage of explicit methods like cladistics and GDI is that you know what the input is, and so does everyone else if you are honest about reporting it. So if someone disagrees with your character coding or with how much the belly sags on your model sauropod, you can have a constructive discussion and hopefully science as a whole gets closer to the right answer (even if we have no way of knowing if or when we arrive, and even if your pet hypothesis gets trampled along the way). DO be appropriately skeptical of your own results without either accepting them as gospel or throwing them out as worthless. The fact that the answer changes as you vary the parameters is a feature, not a bug. Investigate a range of possibilities, report all of those results, and feel free to argue why you think some of the results are better than others. Give people enough information to replicate your results, and compare your results to those of other workers. Figure out where yours differ and why. Try to think of more interesting things you could do with your results. Don Henderson went from digitally slicing critters (Henderson 1999) to investigating floating sauropods (Henderson 2004) to literally putting sauropods through their paces (Henderson 2006)–not to mention working on pterosaur flight and swimming giraffes and other cool stuff. I’m not saying you should run out and do those exact things, but rather that you’re more likely to come up with something interesting if you think about what you could do with your GDI results instead of treating them as an end in themselves. How massive was GPIT1, really? Beats me. I’m not the only one who has done a mass estimate based on that skeleton. Gunga et al. (2007) did not one but two volumetric mass estimates based on GPIT1, and Mallison (2010) did a whole series, and they published their models so we can see how they got there. (In fact, many of you have probably been reading this post in slack-jawed horror, wondering why I was ignoring those papers and redoing the mass estimate the hard way. Now you know!) I’m going to discuss the results of Gunga et al. (2007) first, and come back to Mallison (2010) at the end. For both mass estimates they used a density of 0.8, which I think is probably on the low end of the range for prosauropods but not beyond the bounds of possibility. They got a mass of 630 kg for the slender model and 912 kg for the robust one. Their 630-kg estimate for the slender model is deceptively close to the upper end of my range; deceptive because their 630-kg estimate assumes a density of 0.8 and my 636-kg one assumes a density of 1.0. The volumes are more directly comparable: 636 L for mine, 790 L for their slender one, and 1140 L for their robust one. I think that’s pretty good correspondence, and the differences are easily explained. My version is even more skinnier than their slender version; I made it about as svelte as it could possibly have been. I did that deliberately, because it’s always possible to pack on more soft tissue but at some point the dimensions of the skeleton establish a lower bound for how voluminous a healthy (i.e., non-starving) animal could have been. The slender model of Gunga et al. (2007) looks healthier than mine, whereas their robust version looks, to my eye, downright corpulent. But not unrealistically so; fat animals are less common than skinny ones but they are out there to be found, at least in some times and places. It pays to remember that the mass of a single individual can fluctuate wildly depending on seasonal food availability and exercise level. For GPIT1, I think something like 500 kg is probably a realistic lower bound and 900 kg is a realistic upper bound, and the actual mass of an average individual Plateosaurus of that size was somewhere in the middle. That’s a big range–900 kg is almost twice 500 kg. It’s hard to narrow down because I really don’t know how fleshy Plateosaurus was or what it’s density might have been, and I feel less comfortable making guesses because I’ve spent much less time working on prosauropods than on sauropods. If someone put a gun to my head, I’d say that in my opinion, a bulk somewhere between that of my model and the slender model of Gunga et al. is most believable, and a density of perhaps 0.85, for a result in the neighborhood of 600 kg. But those are opinions, not hypotheses, certainly not facts. I’m happy to see that my results are pretty close to those of Mallison (2010), who got 740 L, which is also not far off from the slender model of Gunga et al. (2007). So we’ve had at least three independent attempts at this and gotten comparable results, which hopefully means we’re at least in the right ballpark (and pessimistically means we’re all making mistakes of equal magnitude!). Heinrich’s paper is a goldmine, with loads of interesting stuff on how the skeleton articulates, what poses the animal might have been capable of, and how varying the density of different body segments affects the estimated mass and center of mass. It’s a model study and I’d happily tell you all about it but you should really read it for yourself. Since it’s freely available (yay open access! ), there’s no barrier to you doing so. So: use GDI with caution, but do use it. It’s easy, it’s cool, it’s explicit, it will give you lots to think about and give us lots to talk about. Stay tuned for related posts in the not-too-distant future. Gunga, H.-C., Suthau, T., Bellmann, A., Friedrich, A., Schwanebeck, T., Stoinski, S., Trippel, T., Kirsch, K., Hellwich, O. 2007. 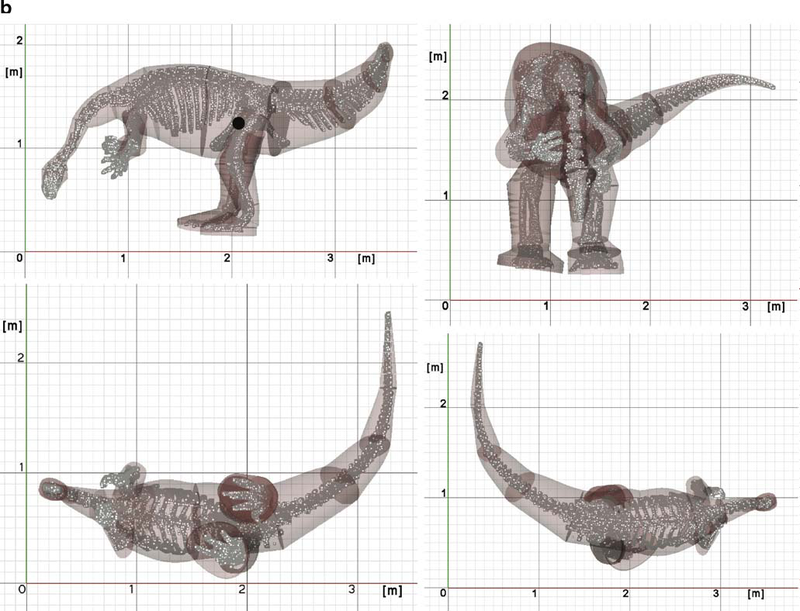 Body mass estimations for Plateosaurus engelhardti using laser scanning and 3D reconstruction methods. Naturwissenschaften 94(8):623-630. Hazlehurst, G.A., and Rayner, J.M. 1992. Flight characteristics of Triassic and Jurassic Pterosauria: an appraisal based on wing shape. Paleobiology 18(4):447-463. Henderson, D.M. 1999. Estimating the mass and centers of mass of extinct animals by 3D mathematical slicing. Paleobiology 25:88-106. Henderson, D.M. 2004. Tipsy punters: sauropod dinosaur pneumaticity, buoyancy and aquatic habits. Proceedings: Biological Sciences 271 (Supplement):S180-S183. Henderson, D.M. 2006. 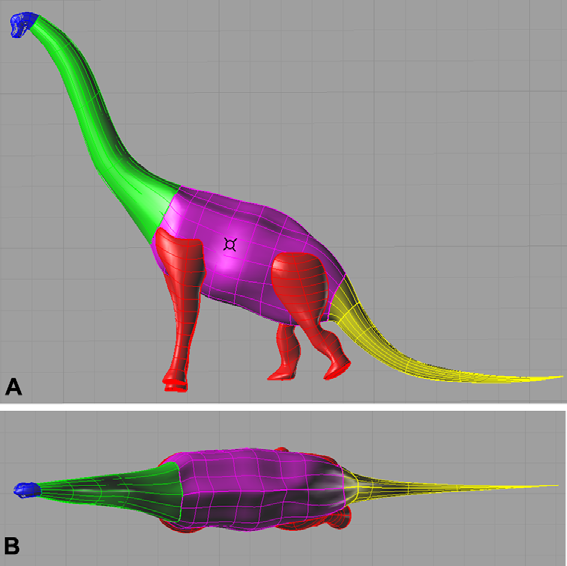 Burly gaits: centers of mass, stability and the trackways of sauropod dinosaurs. Journal of Vertebrate Paleontology 26:907-921. Hurlburt, G. 1999. 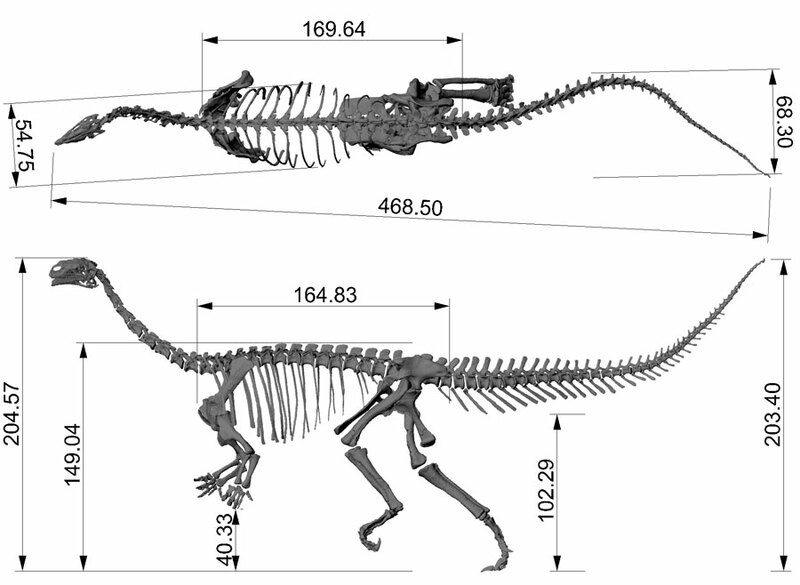 Comparison of body mass estimation techniques, using Recent reptiles and the pelycosaur Edaphosaurus boanerges. Journal of Vertebrate Paleontology 19:338–350. Jerison, H.J. 1973. Evolution of the Brain and Intelligence. Academic Press, New York, NY, 482 pp. Mallison, H., Hohloch, A., and Pfretzschner, H.-U. 2009. Mechanical digitizing for paleontology–new and improved techniques. Palaeontologica Electronica 12(2):4T, 41 pp. Mallison, H. 2010. The digital Plateosaurus I: Body mass, mass distribution, and posture assessed by using CAD and CAE on a digitally mounted complete skeleton. Palaeontologica Electroncia 13(2):8A, 26 pp. Motani, R. 2001. Estimating body mass from silhouettes: testing the assumption of elliptical body cross-sections. Paleobiology 27(4):735–750. Murray, P.F. and Vickers-Rich, P. 2004. Magnificent Mihirungs. Indiana University Press, Bloomington, IN, 410 pp. Taylor, M.P. 2009. 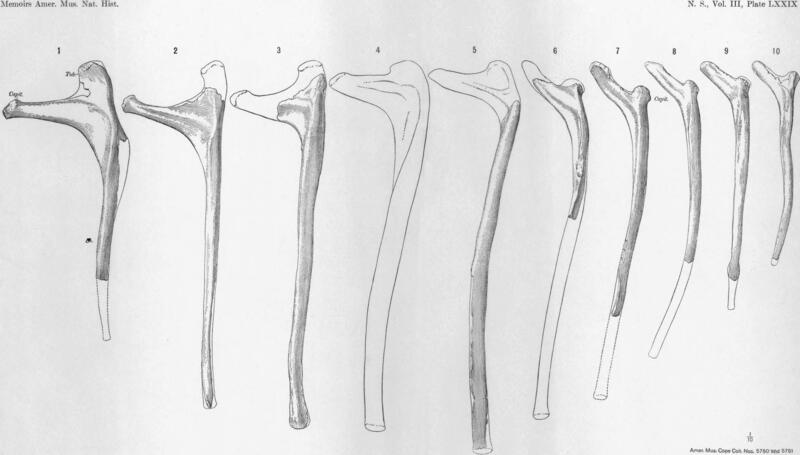 A re-evaluation of Brachiosaurus altithorax Riggs 1903 (Dinosauria, Sauropoda) and its generic separation from Giraffatitan brancai (Janensch 1914). 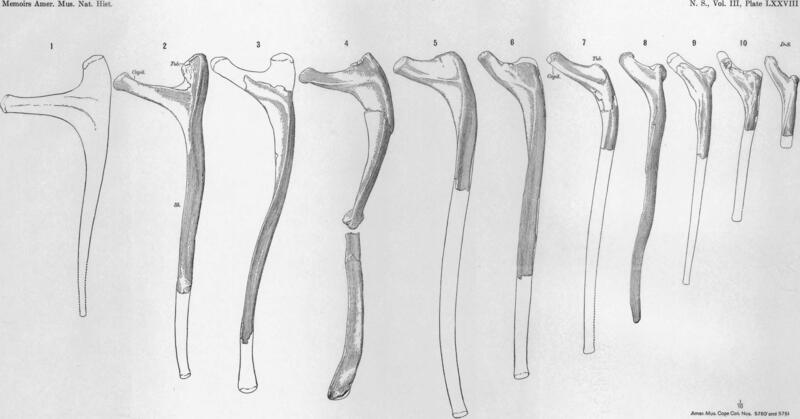 Journal of Vertebrate Paleontology 29(3):787-806. Wedel, M.J. 2007. 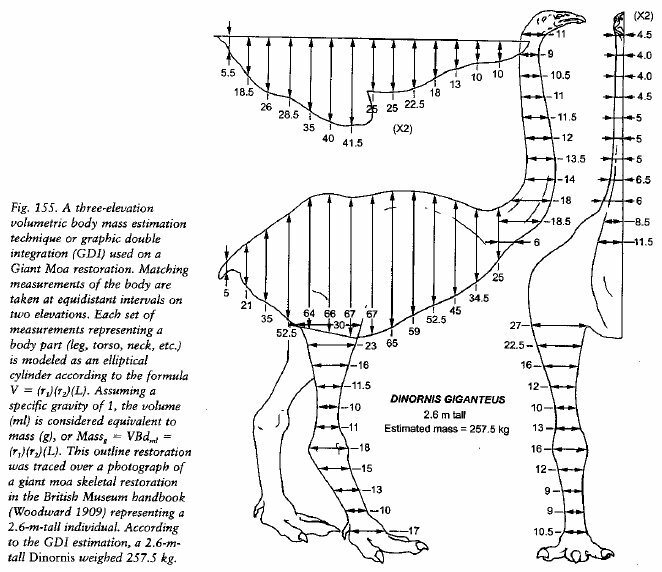 What pneumaticity tells us about ‘‘prosauropods,’’ and vice versa. Special Papers in Palaeontology 77:207–222. For reasons that will soon become apparent (yes, that’s a teaser), Matt and I wanted to figure out how heavy Camarasaurus was. This is the story of how I almost completely badgered up part of that problem. I am publishing it as a cautionary tale because I am very secure and don’t mind everyone knowing that I’m an idiot. Now here’s the problem. How fat is the sauropod? Look at the top-view of Giraffatitan in the Gunga et al. figure above: it’s easy to imagine that the torso could be say 20% narrower from side to side, or 20% broader. Those changes to breadth would affect volume in direct proportion, which would mean (if the torso is 70% of the whole animal) a change in total body volume of 14% either way. Significant stuff. So what do we know about the torso breadth in sauropods? It obviously dependant primarily on the orientation of the ribs and their articulation to the dorsal vertebrae. And what do we know about that? Holland unfortunately did not discuss the torso shape that he illustrated, merely asserting it. 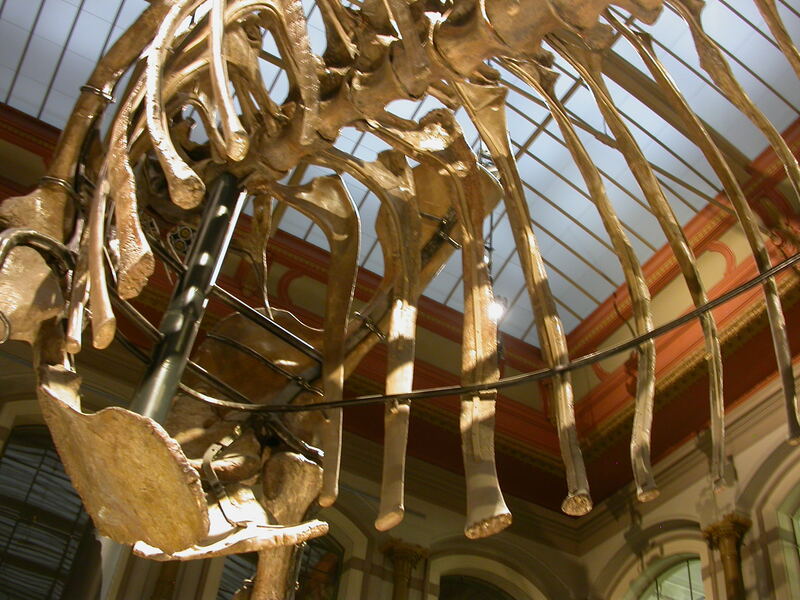 Presumably it is based on the mounted skeleton of the Diplodocus carnegii holotype CM 84, which is at the Carnegie Museum in Pittsburgh, where Holland was based. I have no reason to doubt it; just noting that it wasn’t discussed. Measuring off the height and width of the torso at the seventh dorsal vertebra, using GIMP, I find that they are 341 and 292 pixels respectively, so that the eccentricity is 341/292 = 1.17. 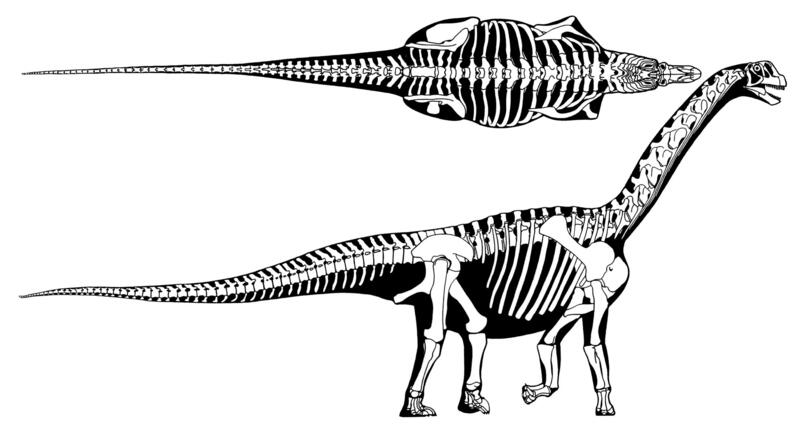 This compares with 1760/916 = 1.92 for Holland’s Diplodocus above, so if both figures are accurate, then Camarasaurus is much fatter than Diplodocus. What’s going on here? 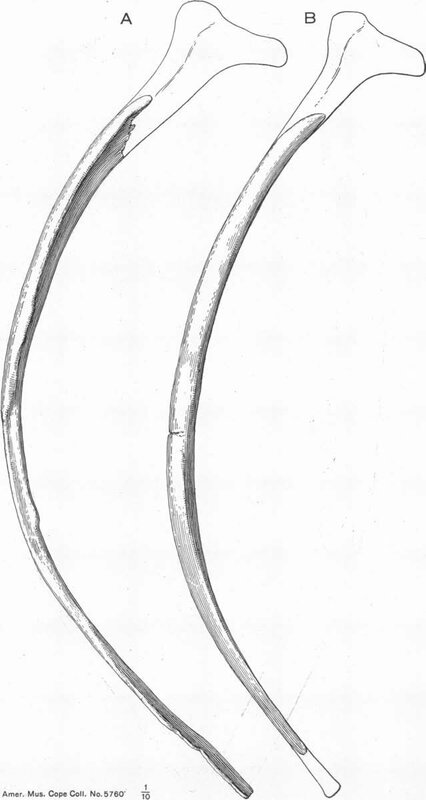 In the plates above, the ribs do not curve inwards as in this cross-section: they are mostly straight, and in many case seem to curve negatively — away from the torso. So why do O&M draw the ribs in this position that looks perfectly reasonable? So why do these ribs look so totally different from those in the plates above? I’ll give you a moment to think about that before I tell you the answer. Got it? I bet most of you have. Osborn and Mook 1921:fig. 71. 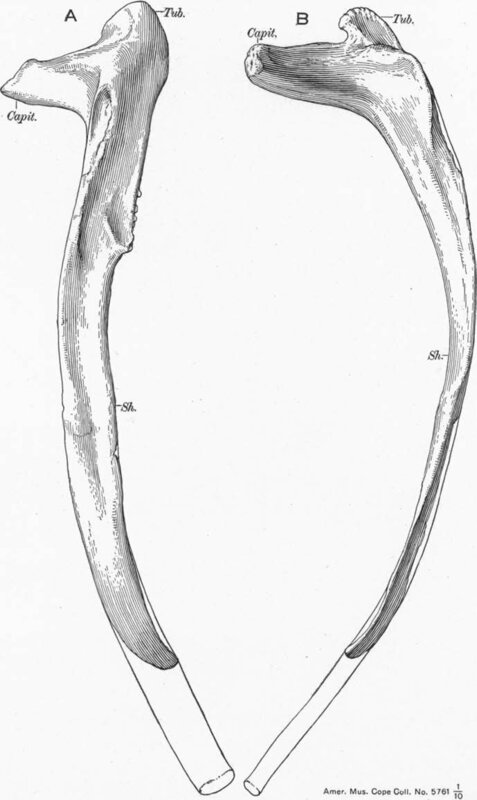 Left rib of Camarasaurus supremus Cope. Rib 4 (Amer. Mus. Cope Coll. No. 5761/R-A-24). (A) direct external view when placed as in position in the body; (B) direct anterior when placed as in position in the body. Capit. capitulum; Sh. shaft; Tub. tuberculum. Reconstructed view, portion in outline. And, my word, isn’t it embarrassingly obvious once you see it? 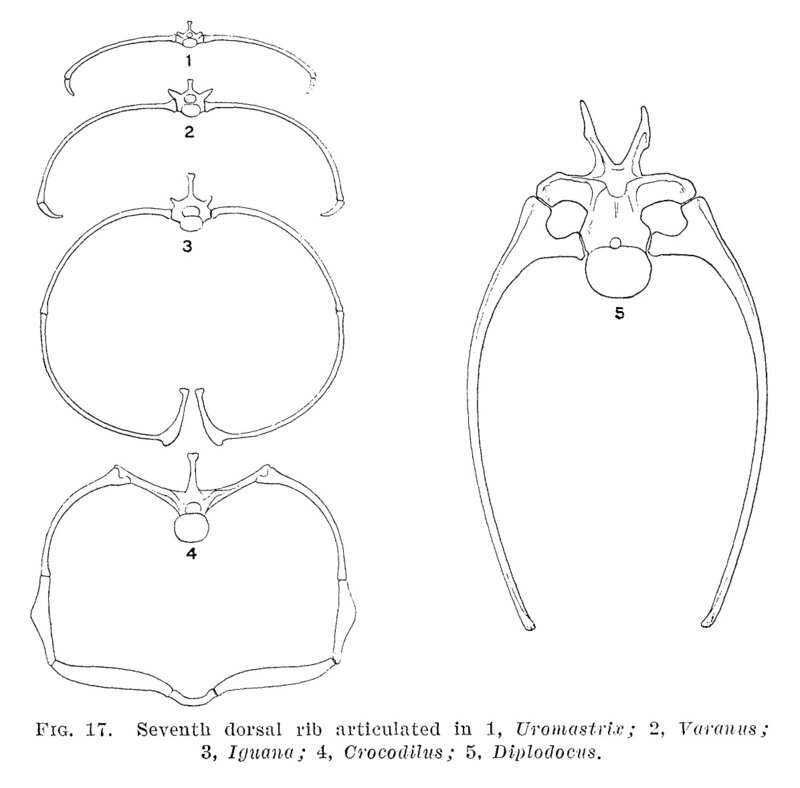 I’d been blithely assuming that the ribs in O&M’s plates were illustrated in anterior view, with the capitula (which articulate with the parapophyses) located more medially, as well as more ventrally, than the tubercula (which articulate with the diapophyses). But no: as in fact the captions of the plates state perfectly clearly — if I’d only had the wits to read them — the ribs are shown in “external” (i.e. lateral) view. Although it’s true that the capitula in life would indeed have been more medially positioned than the tubercula, it’s also true that they were more anteriorly positioned, and that’s what the plates show at the rib heads. And the curvature that I’d been stupidly interpreting as outward, away from the midline, is in fact posteriorly directed: the ribs are “swept back”. The ventral portions of the ribs also curve medially, away from the viewer and into the page … but of course you can’t see that in the plates. The important truth — and if you take away nothing else from this post, take this — is that I am dumb bones are complex three-dimensional objects, and it’s impossible to fully understand their shape from single-view illustrations. It’s for this reason that I make an effort, when I can, to illustrate complex bones from all cardinal directions — in particular, with the Archbishop bones, as for example “Cervical S” in the Brachiosaurus coracoid post. 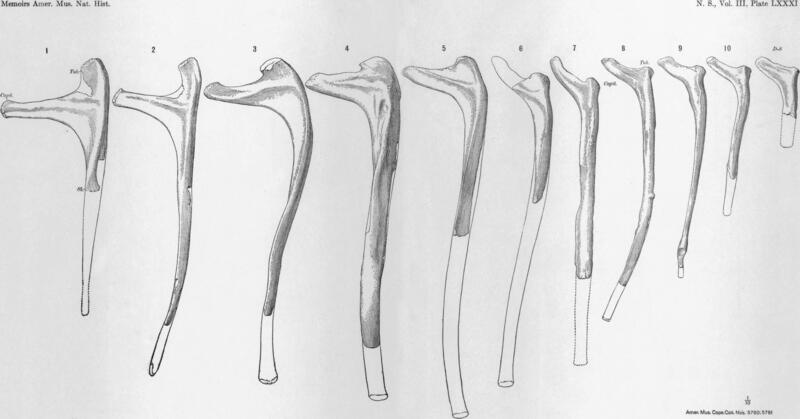 Because ribs, in particular, are such complex shapes — because their curvature is so unpredictable, and because their articulation with the dorsal vertebrae is via two points which are located differently on successive vertebrae, and because this articulation still allows a degree of freedom of movement — orthogonal views, even from all cardinal directions, are of limited value. Compositing figures will give misleading results … as demonstrated above. PhotoShop is no more use here. Fly, you fools! 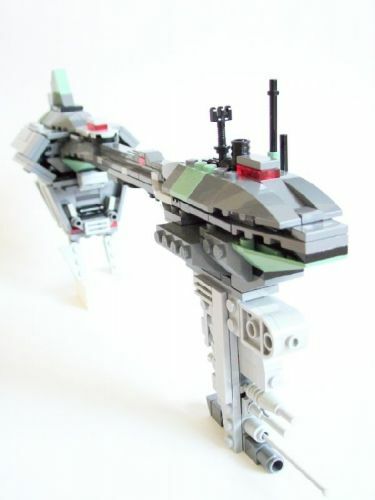 Paradoxically, our best source of information on the shapes of saurpod torsos is: mounted skeletons. I say “paradoxically” because we’ve all grown used to the idea that mounts are not much use to us as scientists, and are really there only as objects of awe. As Brian Curtice once said, “A mounted skeleton is not science. It’s art. Its purpose is to entertain the public, not to be a scientifically accurate specimen”. In many respects, that’s true — especially in skeletons like that of the “Brontosaurus” holotype, YPM 1980, where the bones are restored with, and in some cases encased in, plaster so you can’t tell what’s what. But until digital scanning and modelling make some big steps forward, actual mounted skeletons are the best reference we have for the complex articulations of ribs. And I finish this very long (sorry!) post with yet another note of caution. Ribs are long and thin and very prone to damage and distortion. It’s rare to find complete sauropod ribs (look closely at the O&M plates above for evidence), but even when we do, we shouldn’t be quick to assume that the shape in which they are preserved is necessarily the same as the shape they had in life. (If you doubt this, take another look at rib #6 in the third of the four O&M plates above.) And as if that weren’t enough to discourage us, we should also remember that the vertebra-rib joints would have involved a lot of cartilage, and we don’t know its extent or shape. So bearing in mind the complicated 3D shape of ribs and of dorsal vertebrae, the tendency for both to distort during and after fossilisation, and the complex and imperfectly known nature of the joints between them, I think that maybe I wasn’t too far wrong earlier when I said that what we know about sauropod torso shape is: nothing. Gunga, H. C., K. A. Kirsch, J. Rittweger, A. Clarke, J. Albertz, A. Wiedemann, S. Mokry, T. Suthau, A. Wehr, W.-D. Heinrich and H.-P. Schulze. 1999. 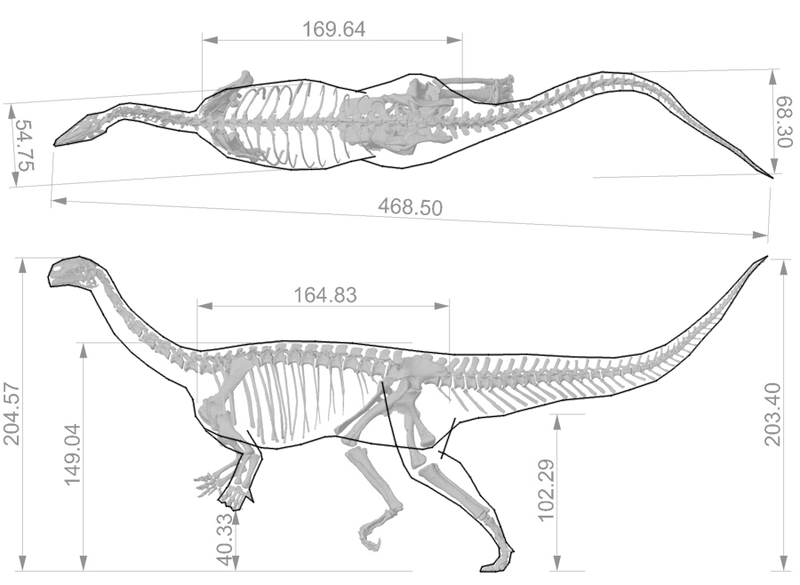 Body Size and Body Volume Distribution in Two Sauropods from the Upper Jurasic of Tendaguru (Tanzania). Mitteilungen des Museums fur Naturkunde Berlin, Geowissenschaftliche Reihe 2: 91-102. Gunga, Hans-Christian, Tim Suthau, Anke Bellmann, Stefan Stoinski, Andreas Friedrich, Tobias Trippel, Karl Kirsch and Olaf Hellwich. 2008. A new body mass estimation of Brachiosaurus brancai Janensch, 1914 mounted and exhibited at the Museum of Natural History (Berlin, Germany). Fossil Record 11: 28-33. Holland, W. J. 1910. A review of some recent criticisms of the restorations of sauropod dinosaurs existing in the museums of the United States, with special reference to that of Diplodocus carnegiei [sic] in the Carnegie museum. American Naturalist 44: 259-283. Paul, Gregory S. 2010. The Princeton Field Guide to Dinosaurs. Princeton University Press, Princeton, New Jersey. 320 pages. Taylor, Michael P. 2009a. 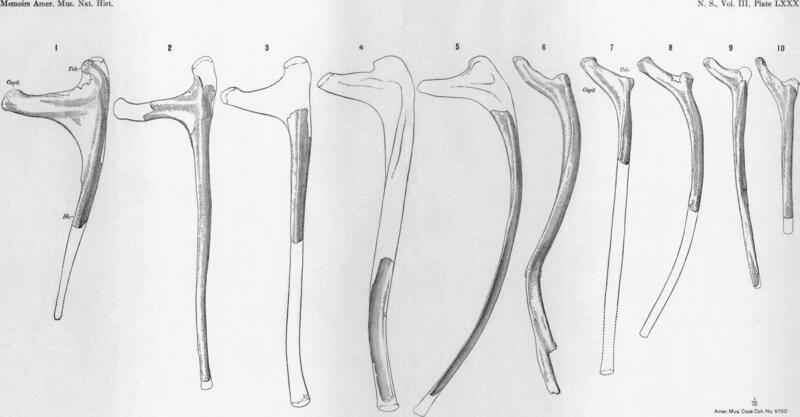 A re-evaluation of Brachiosaurus altithorax Riggs 1903 (Dinosauria, Sauropoda) and its generic separation from Giraffatitan brancai (Janensch 1914). 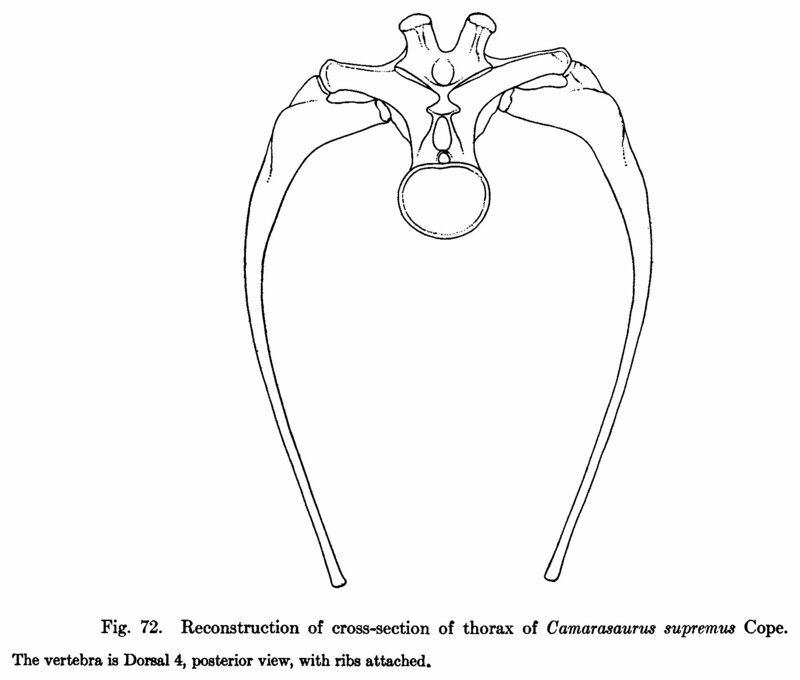 Journal of Vertebrate Paleontology 29(3):787-806. By a curious coincidence, today’s Bob The Angry Flower cartoon is all about the Archbishop description. But, hey, at least I got my confession in early — I was officially the first participant to fail the 2010 Paleo Project Challenge. In most journals, in-line citations are by author and year. So, for example, if someone writes “Haplocanthosaurus has been recovered as a non-diplodocimorph diplodocoid (Wilson 2002)”, you know that the paper that recovered Haplo in that position was, well, Wilson 2002. And everyone who works on sauropods is familiar with Wilson 2002. This is completely stupid, of course, but you can just about see why the world is that way: S&N are basically print journals (albeit with online editions), and space is at a very tight premium. So this kind of extreme compression may be worth the pain it costs in terms of space recovered. But you want to know what’s really stupid? PLoS ONE, and the rest of the PLoS journals, use numbered references. Yes, PLoS ONE, the online-only journal that has no length restrictions whatsoever. 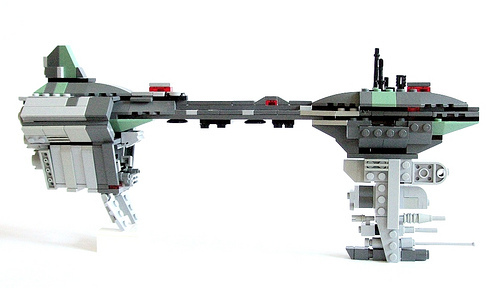 In PLoS ONE, you can have as many giant figures as you need, and as many tables, and as much text. Yet still they niggle away at space by using the objectively inferior numbered-references format. I can only assume it’s because they want to look like Science ‘n’ Nature. Which is really, really, really stupid, because the whole point of the PLoS journals is that they’re not Science and Nature. PLoS is the antidote to all the dumb diseases that the tabloids have infected us all with. But for some reason, this particular part of the Tabloid Plague Complex — numbered references — has been picked out as worthy of promotion. The stupid, it burns. I’ve made no secret of the fact that when I finally get around to finishing the Archbishop description, I’ll be sending it to PLoS ONE, mostly because of its open access and its handling of figures: no limits on number, and they’re made available at original resolution. 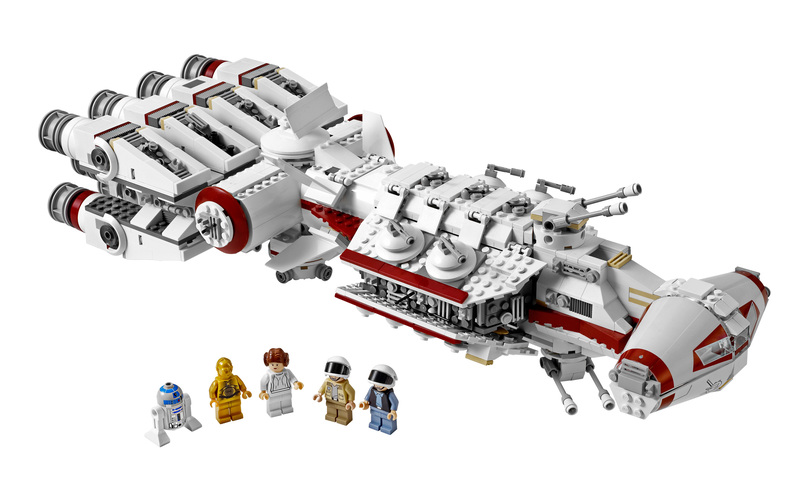 The use of numbered references is a significant drawback to comprehensibility, but a price I’m prepared to pay in order to get those delicious figures. Everyone loves PLoS — I can’t stand their referencing … I just think no way would I want to have a reader of a my hypothetical longer paper suffer that. And yes, it is an abolute deal breaker for me. The longest paper I had to deal with was Hocknull’s “short” monograph on titanosauriforms/Australovenator. What a nightmare for me. I hadn’t realised how strongly the feelings run for some people. My interlocutor was dead serious — I did check. He’s going to be not sending his good papers to PLoS journals for this single reason. Because of this dumb, ever-so-avoidable screwup. 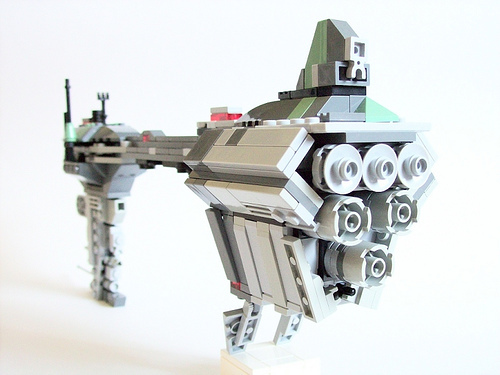 The very nice Lego Nebulon B Frigate that decorates this page is the “Malevolent Nova”, created by The One They Call Eric.